The latest issue of the Automotive News Europe monthly e-magazine goes live on Monday, Dec. 1. 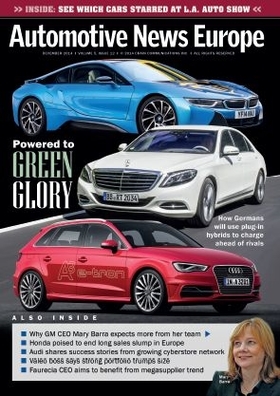 This issue looks how German premium automakers plan to profit from plug-in hybrids. Volkswagen, Audi, Porsche, BMW and Mercedes are embracing plug-in hybrids as the best of both worlds because they say the cars offer zero-emissions driving without causing range anxiety and without asking customers to sacrifice on performance. There is another reason for the shift: Plug-ins are given preferential treatment by regulators when it comes to determining the car’s so-called “certified” CO2 emissions. While most premium brands and VW are moving into the plug-in niche, most volume automakers are much more cautious following the failure of the Opel Ampera. Our cover story looks at the risks and rewards offered by plug-in hybrids in Europe. Continuing with the theme of the cover story, our Latest Launches section highlights the rising availability in Europe of vehicles with low-CO2 powertrains. Three of the models we tested are plug-in hybrids: the Audi A3 Sportback e-tron, the Mercedes-Benz S 500e and the Volkswagen Golf GTE. The fourth model is the Lexus NX, which only will be sold in Europe with a gasoline-electric hybrid powertrain. Some of the most powerful automotive executives in the world recently have met with reporters and editors from Automotive News Europe and its sister publication, Automotive News. Our Q&A section includes interviews with: General Motors CEO Mary Barra, who explains how she plans to change the corporate culture at the U.S.’s largest automaker; Ford CEO Mark Fields, who shares why he has shaken up the company’s leadership in Europe; Renault-Nissan CEO Carlos Ghosn, who discusses his views on fuel cells and autonomous cars; and Juergen Stackmann, president of VW Group subsidiary Seat, who is confident he will turn the Spanish brand into a consistent money-maker after years of losses. Honda says new models and a leaner organization will help it rebound in Europe next year after nearly a decade of declining sales. A key launch will be the HR-V subcompact crossover. On the retail side, we explain why VW and BMW have the most efficient dealer networks in Europe; we get an update from Audi on the positive effects of its cyberstores; and we find out first hand how BMW’s revised retail plan is changing the way the automaker’s cars are sold. Our supplier section highlights the differing views regarding the trend to create massive global partmakers. Valeo CEO Jacques Aschenbroich is not convinced that size matters. His assessment contrasts with the views of Faurecia CEO Yann Delabriere. The section concludes with a look at why relations between automakers and suppliers are deteriorating.